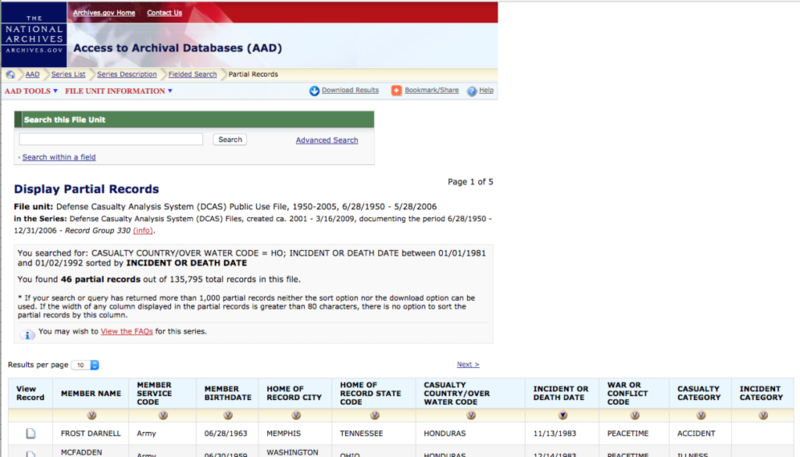 The Defense Casualty Analysis System (DCAS) is the official U.S. National archives of recorded military deaths. DCAS reports that 46 American military members died in Honduras between January 1, 1981 and February 1, 1992 (the dates of the overall Central America War). Research by USContraWar establishes that at least 70 U.S. military members were killed during the Central America War in Honduras or who were based in Honduras. Twenty-two American military members are listed by DCAS as being killed in El Salvador during the war. Of these twenty-two at least seven, as many as fourteen, were based in Honduras operating under combat and combat support missions in neighboring war zones. In 1996, President Clinton designated El Salvador (1981-1992) a combat area issuing some 5,000 combat medals to those troops. Honduras is currently not recognized as a combat or combat support operation or even an official military operation. The Pentagon and U.S. Army maintain that Honduras was safe for ‘training and war games’ and was a noncombat area. 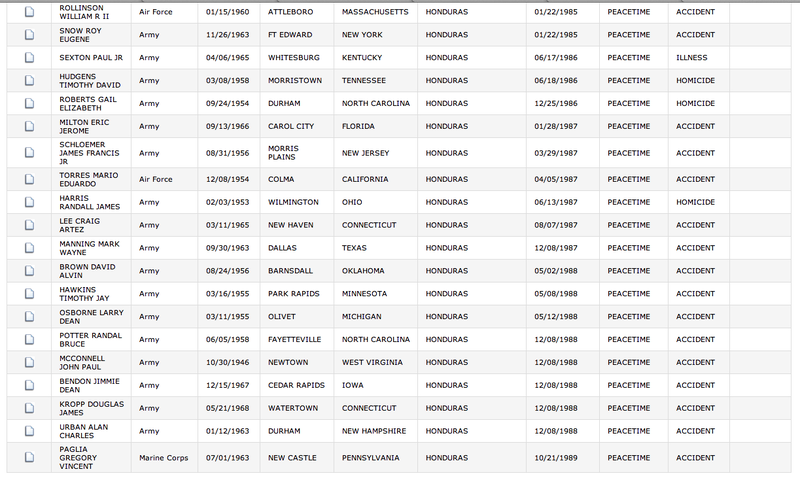 U.S. military members who were deployed to Honduras during the war period do not have these deployments listed in their official military records. New finding from ON GUARD magazine, Vol. II, Issue 2, No. 6, 1987. Tells the story of a mother wanting answers regarding her sons mysterious death in Honduras. 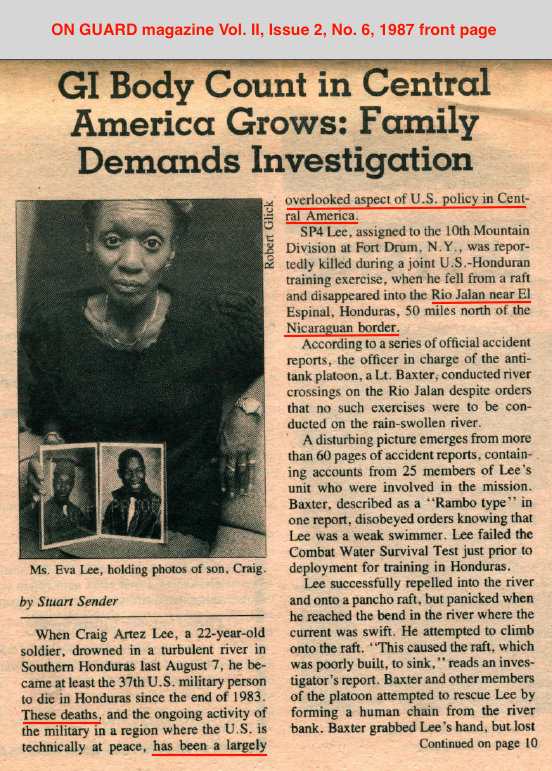 Ms. Eva Lee demanded answers regarding her son Craig Lee’s apparent drowning accident on August 7, 1987 in Honduras. 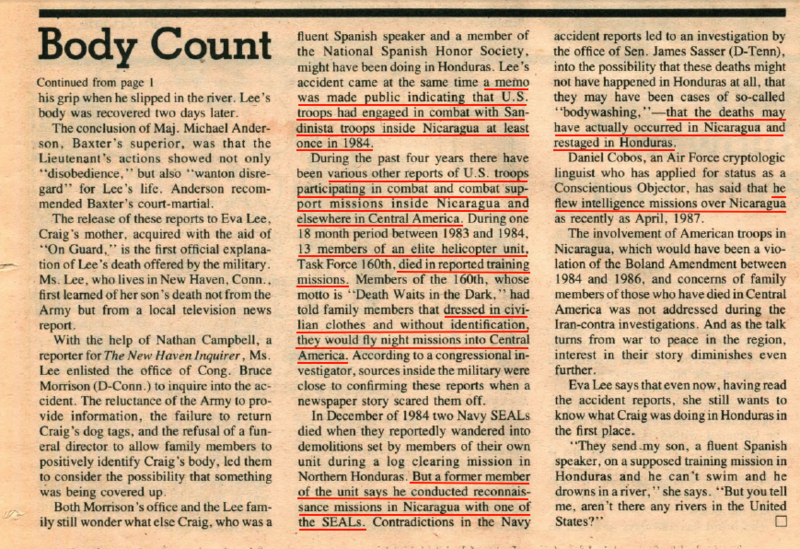 The article details other deaths of U.S. military in and around Honduras before mid 1987. USContraWar research establishes the January 22, 1985 plane crash killed all 21 U.S. troops on board. 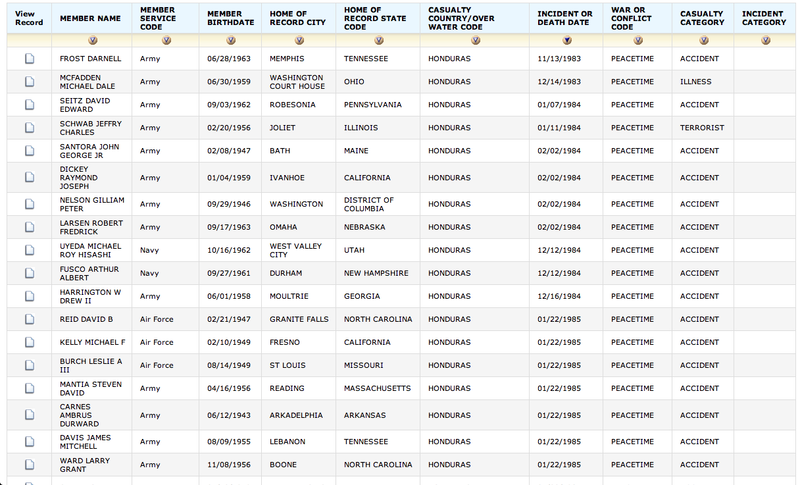 Only 13 are reported on the Defense Casualty Analysis System’s website. These figures should be changed to reflect the actual numbers in honor of the families and the killed. Of the 22 U.S. military members killed in El Salvador during the war at least 12 were based in Honduras including LTC David Pickett, CWO4 Daniel Scott and SP4 Earnest Dawson who were killed by communists guerrillas near Lolotique, El Salvador on the return leg of a round-trip flight from Soto Cano Air Base, Honduras to San Salvador, El Salvador when they were shot down. Scott was killed while piloting the helicopter. LTC Pickett and then PFC Dawson survived the crash, were captured by the enemy and later executed as wounded Prisoners of War. LTC Pickett was awarded the POW Medal in 2003 posthumously. SP4 Dawson and his family have yet to be honored with the POW Medal. CWO2 JEFFRY SCHWAB was killed on January 11, 1984 by Nicaraguan government troops after his helicopter was shot down, followed by additional small arms fire when he was fatally struck in the head by a round. The Nicaraguan government claimed that they shot his helicopter down over Nicaraguan air space. The U.S. Government claimed they were flying over Honduran air space when they were shot down. Two other U.S. troops escaped, apparently without injuries. 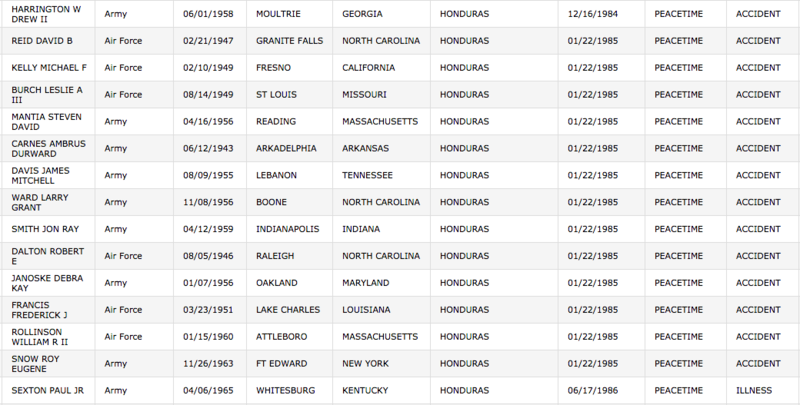 This is the only listed Honduran based American military casualty the U.S. government has publicly acknowledged AS RELATED TO THE CONFLICT and the incident is listed as a terrorist act during peace time. Nicaraguan troops were not terrorists. Jeff Schwab’s Purple Heart reads “FOR WOUNDS RECEIVED IN ACTION IN HONDURAS ON 11 JANUARY 1984 WHICH RESULTED IN DEATH.” Jeff saved the lives of his two passengers and has not been posthumously awarded a combat award for valor. 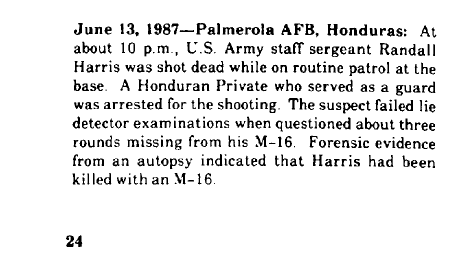 On June 13, 1987 Military Policeman Randall Harris was shot and killed while patrolling the perimeter fence at Palmerola Air Base (Soto Cano). The U.S. Government asserts he was killed by a Honduran soldier and is listed as a homicide. Terrorists and guerrilla insurgent activity was rampant throughout Honduras during the war. Randall Harris was never given any combat honors. 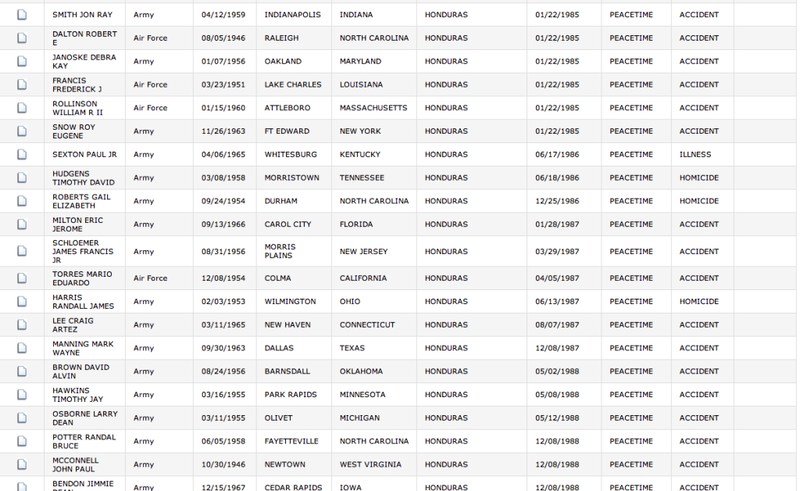 Two other U.S. troops were killed in Honduras and are listed as homicide. Two U.S. troops are listed as killed by homicide in El Salvador during the Central America War, but we now know they are LTC Pickett and SP4 Dawson who were both wounded POW’s who were executed. Several others died in Honduras under mysterious circumstances including W. Drew Harrington, Craig Lee, Arthur Fusco and Michael Uyeda to mention a few. U.S. troops murdered in Vietnam, Afghanistan, Iraq or at Ft. Hood by ‘friendly’ forces or terrorists receive proper combat honors and recognition. If Honduras and the overall Central America Campaign was properly designated an Imminent Danger Area and these incidents were properly designated as hostile acts, these troops and their families would receive proper combat honors and recognition. Gold Stars would be honored upon the families. Please see the Military and Terrorist Attacks in Honduras chronological list page of all currently known military and terrorist attacks in Honduras during the Central America War WHERE MANY MORE DOZENS WERE WOUNDED. On July 17, 1988 nine service members in San Pedro Sula were attacked when a grenade was thrown at them and automatic weapons were fired at them resulting in six wounded. These six were awarded the Purple Heart. On February 18, 1989 in Comayagua an explosive devise was detonated against a bus carrying U.S. military. Three U.S. troops were wounded by shrapnel and two Honduran passerby’s also wounded. No Purple Hearts were awarded. On July 13, 1989 in La Cieba, seven Military Policeman from the 549th MP Company in Panama were injured when a bomb was thrown at them while they were crossing a bridge. The MP’s were based out of Palmerola or Soto Cano Air Base protecting engineers who were on a road building project called Fuertes Caminos. No Purple Hearts were awarded. Please help all C.A. War Veterans and their families advocate for recognition as Veterans of this Low-Intensity Conflict by sending a letter to your U.S. Congress or Senate representative in support of our mission by asking Congress to issue an Armed Forces Expeditionary Medal to all U.S. troops who served in Honduras from 1981 to 1992. This will help the families of the killed and wounded and those veterans attempting to receive proper combat honors and recognition for their sacrifices during the decade that ended Soviet communism.